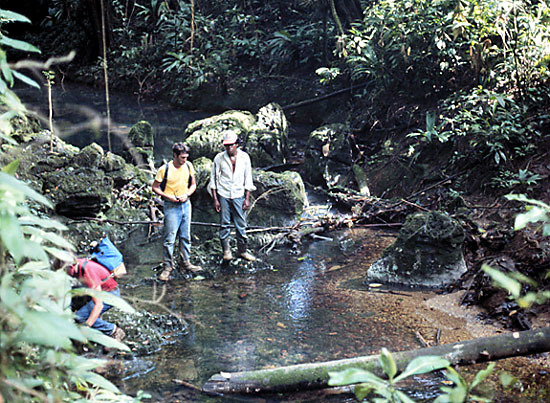 The following collection of images was acquired on four trips to the Montañas de Colón made by geologist/caver Ric Finch during the summer of 1983 while working for the Dirección General de Minas e Hidrocarburos of the GOH, and again for the DGMH during the summer of 1984, and later that same summer on an exploration project for Amoco, and finally in Dec. 1984 with a group of cavers. Although most of the photos were taken by Finch, some were taken by Tom Weiland and others by Ed Yarbrough; apologies for not giving specific photo credits. Some of the shots seem to have a number of buzzards and even the occasional condor in the sky; I take the blame for not finding my air brush to clean these slides before scanning them. 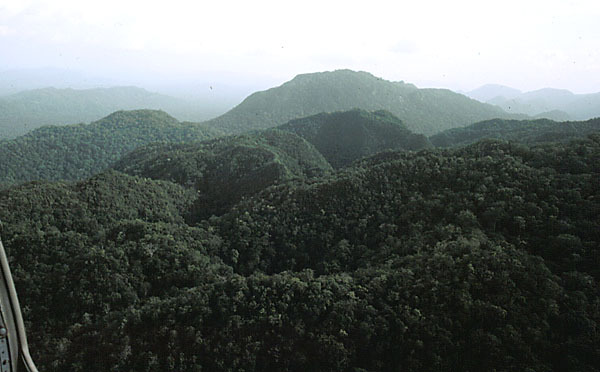 The Montañas de Colón (henceforth, MdeC) comprise a belt of folded limestone mountains extending SW-NE along a section of the border of Honduras with Nicaragua in the Honduran portion of La Mosquitia. 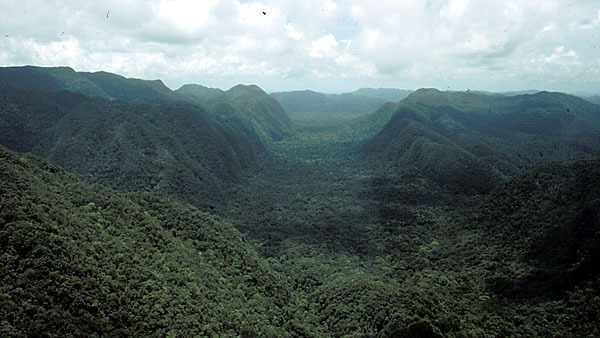 The Cretaceous age carbonate formation, the Atima Limestone of the Yojoa Group, is thousands of feet thick, is highly karstified, and is covered with dense tropical hardwood jungle. Finch's geological work in the area gave him an opportunity to recon the karst area using helicopter support, and also a chance to get familiar with the Sutawala Valley area on the ground, and make some useful contacts. 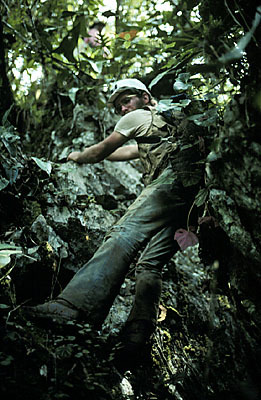 Later in 1984 Finch organized a group of Tennessee cavers to make the first attempt by cavers to explore this karst area. The Tennessee contingent consisted of Finch, Trent Carr, Elwin and Debbie Hannah, and Ed Yarbrough. 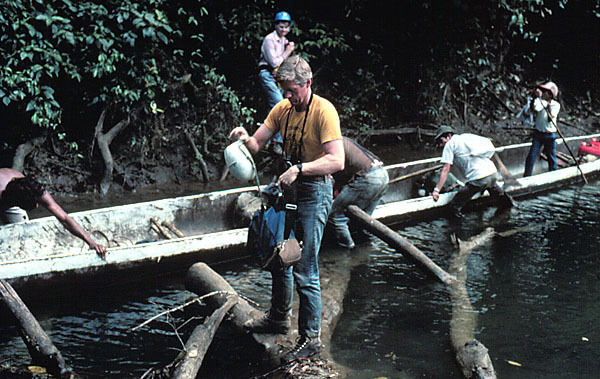 Caver Larry Cohen, then with the US Embassy in Honduras, Economic Section, aided the group from Tegucigalpa in many ways, and also joined the venture in the field. The target area was the Sutawala Valley, which transects the MdeC through some of the most spectacular karst. This valley forms the only feasible path for crossing the range, and the Sutawala Valley trail has undoubtedly been used by the natives since time immemorial. The cavers hoped to use this valley as a route into the heart of the karst. The logistical problems of getting cavers and gear to the target area were, and still are, a major difficulty to the success of any caving trip to this area. 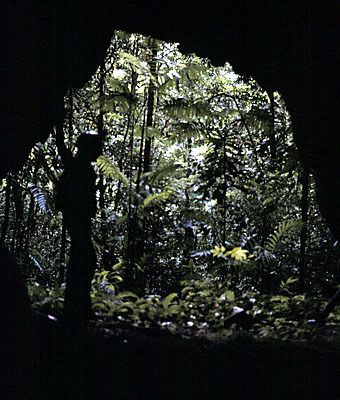 Once in the area, getting around from place to place and finding any caves is yet another difficult problem. Unfortunately, exploring any caves found turned out not to be a problem for the 1984 group. The following selection of images will show the area and some of the logistical problems to be dealt with. It is hoped that the members of the 1984 trip will enjoy seeing these pictures and remembering some good times had, and that the cavers preparing for the 2001 MdeC odyssey will benefit from the preview of challenges to come. 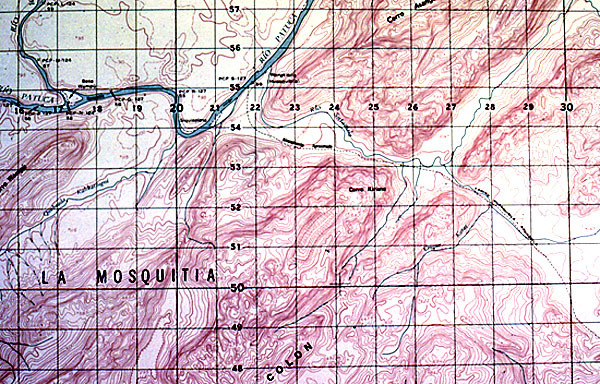 Topographic map of target area; C.I.= 20 m; confluence of Ríos Wampú and Patuca, far left; Cerro Wampú lower left; Sutawala Valley, center. 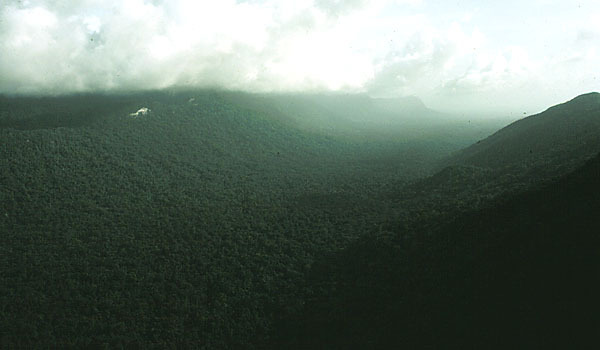 Río Patuca and the MdeC front near the north part of the range; from helicopter, view southward. 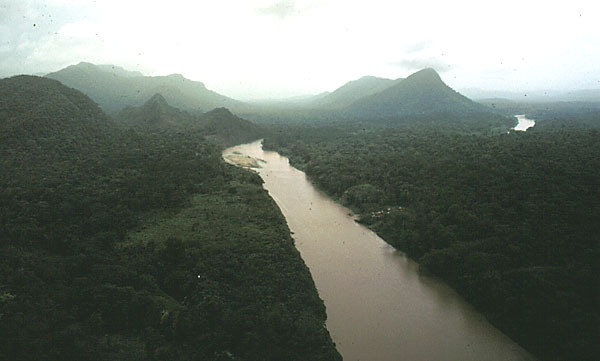 Río Patuca, view upstream along the MdeC front near the Sutawala Valley; Cerro Wampú is the sharp ridge on the right in the background; you can just make out the Sutawala River coming in on the left, just along the near margin of the old agricultural clearing. The very straight course of the Patuca here is fault-controlled. Low water conditions expose outcrops of a sheared shale with blebs of tectonically intercalated limestone. In stereophotos limestone beds along the mountain front can be seen to be truncated. Finch interpreted this fault to be a strike-slip fault, based on the rectilinearity of the river course and the presence throughout Honduras of a suite of large-scale strike-slip faults trending NE. Rogers later reinterpreted this fault as a thrust, based on data not available in 1984: thrusts found in seismic profiles and two deep hydrocarbon test wells drilled in the Ahuás area. Finch now concurs with the thrust interpretation. This fault contact places a limit on the karst area, as the bedrock to the NW consists of clastic strata and lava flows. 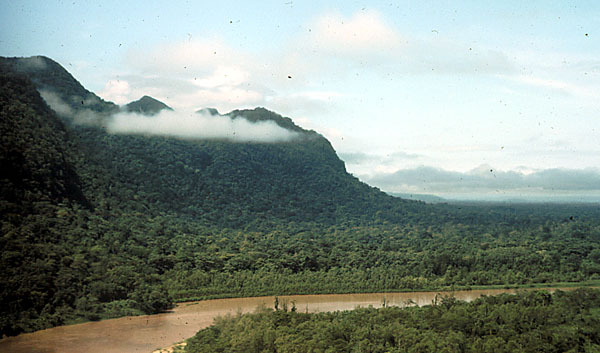 MdeC front and entrance to the Sutawala Valley, Río Patuca in foreground. 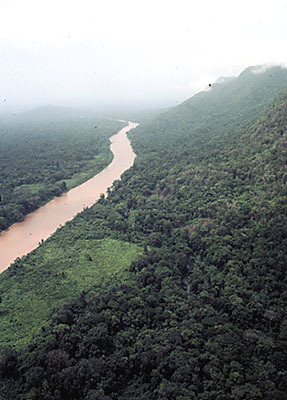 Confluence of the Río Sutawala with the Patuca; the Sutawala can just be seen winding through the trees on the far side of the old agricultural clearing. 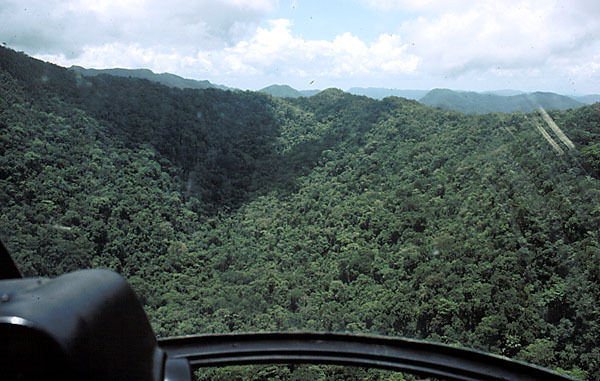 The Sutawala Valley viewed from a helicopter; an unbroken jungle canopy save for an occasional vertical cliff of Atima limestone along the valley walls. 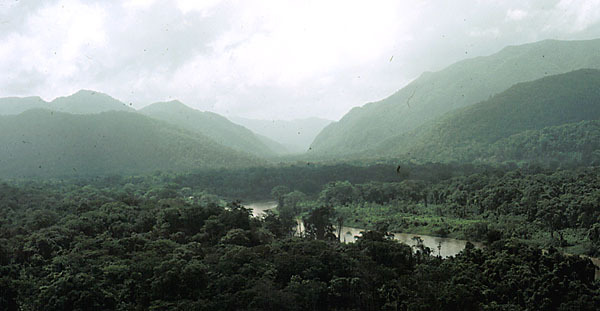 The Río Patuca once flowed through this valley to join the Río Coco to the SE; the evidence for this is the size and morphology of the valley itself-- too big to have been eroded by the Sutawala, and the presence in the valley alluvium of large, well-rounded stream pebbles of quartz that had to be transported into the valley from without, i.e., the Río Sutawala has no source for such clasts. 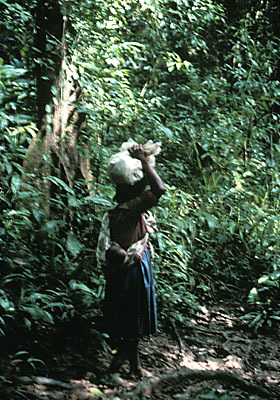 The Patuca probably shifted to its present course due to uplift of the MdeC. Cliffs of Atima limestone along the rim of the Sutawala Valley. A side valley extending NE from the Sutawala Valley, and passing through km sq 27/54. This flat-bottomed valley is floored with shaly beds. Rogers believes the limestone on the right wall of the valley to be a thrust repeated section of same limestone exposed further to the NE (left) of the valley; dip is to the right (SE). Whether the valley wall-floor contacts are sedimentary contacts or faults, they might well lend themselves to the development of contact caves. Rugged karst in the limestone highlands along the south side of the Sutawala Valley. "Helicopter Sink", a 2-km long sinkhole just SW of Cerro Tirisne ("Kirisne" on the map), km sq 23/51. Ahuás airstrip, twin engine Azteca taking off. The 1984 caving group chartered this plane to bring them, in two loads, into Ahuás, as the strip at Wampusirpi was too short to accommodate a twin-engine plane, and using a single engine plane would have required too many flights, at too great an expense. 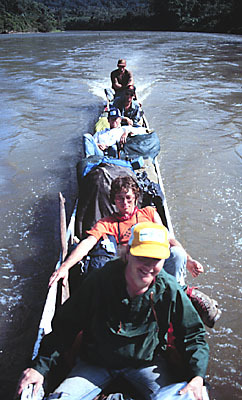 Motoring up the Patuca in a rented 41-foot long pipante; from front to rear: Ric Finch (unseen photographer), Debbie Hannah, Trent Carr, mound of caving gear and camp supplies, Ed Yarbrough, Larry Cohen, and Elwin Hannah at the helm of the 5 hp outboard, brought by the cavers for the trip. 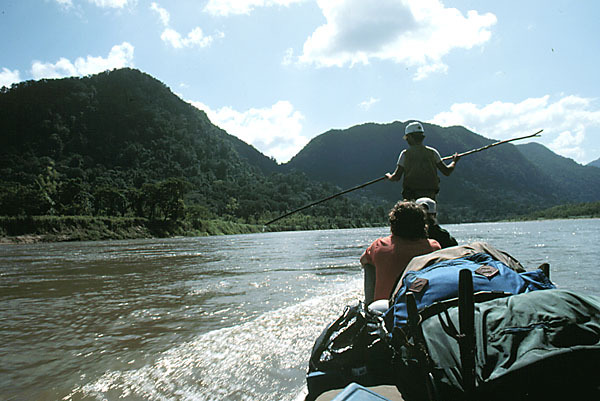 The trip upstream from Ahuás to the Sutawala Valley took on and one-half days: one day to reach Wampusirpi to overnight, and a half-day to reach the Sutawala campsite from there. 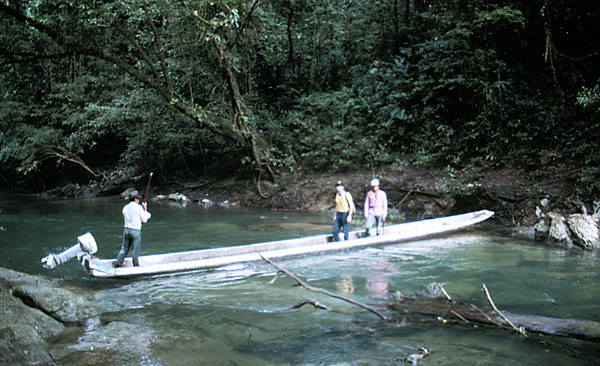 This photo was taken on the second day upstream from Ahuás; on the first day, from Ahuás to Wampusirpi, this pipante had carried, in addition to six cavers and gear, a Honduran man, woman and child and their meager luggage. Finch acting as bowman in the pipante headed upstream. 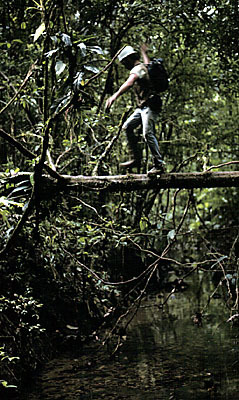 A pipante has a squared off bow and stern; the bowman stands on the bow platform, which typically has a small round hole in it, through which the bowman's staff is thrust to anchor the pipante at muddy landings. The bowman's main job is to tell the motorman which way to steer to keep off shoals, and secondly to use his pole to fend off floating debris and snags when he fails to warn the motorman in time; a highly necessary job on the Patuca which is shallow in many stretches when not in flood. Poling up the Río Sutawala, note how clear this karst stream is compared to the silty brown Patuca. It is possible to take a pipante up the Sutawala for a couple of kilometers, until the first travertine dam blocks further upstream passage. At this point, the main Sutawala Valley trail comes close to the river on the right-hand (southern) bank, and there is a good flat site for a base camp on the left-hand (northern) side of the Sutawala. Although camp can be set up more-or-less out of sight from the trail, it would probably not be a good idea to leave the camp totally unattended at any time. Hauling the pipante over a fallen tree en route up the Sutawala to base camp. All the gear load and passengers had to be removed to slide the big pipante across this obstacle. 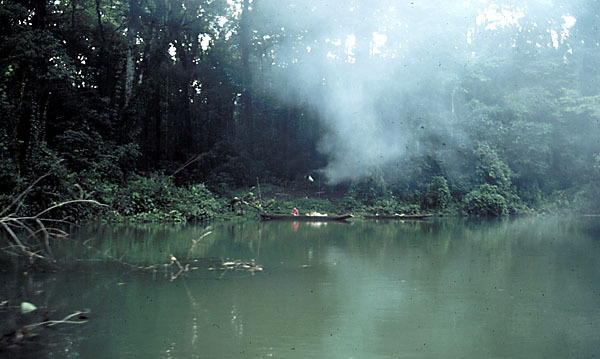 Nicaraguan refugee camp along the Sutawala River during the Contra War. 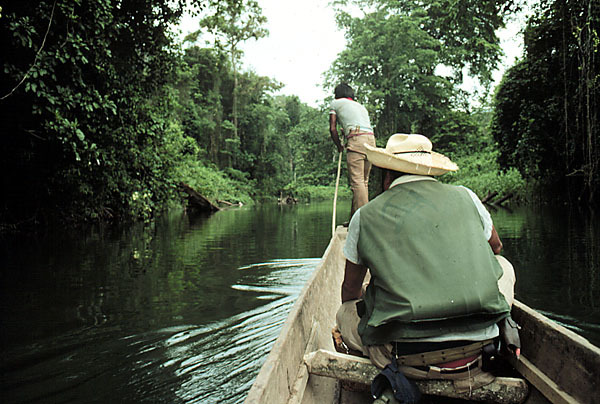 The Sutawala Trail is the only land connection between Honduras and Nicaragua in this region, and during the Contra War refugees from Nicaragua used it to enter Honduras, and, apparently, return to Nicaragua with relief supplies. How much use the trail might see during peacetime is hard to predict. 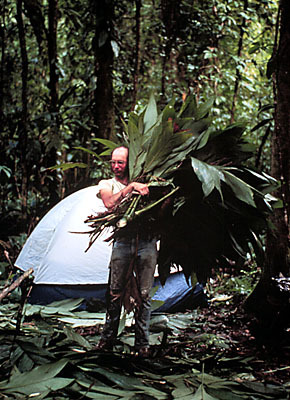 Bringing in the sheaves of palm leaves to floor the campsite. It should be drier in April and May than in July, August or December, but the first thing to do in setting up camp is to floor the area with leaves to keep the amount of mud down. These leaves get worked into the mud and have to be replenished frequently. Fortunately, supplies are handy. Note the sunburn acquired on the trip upriver. 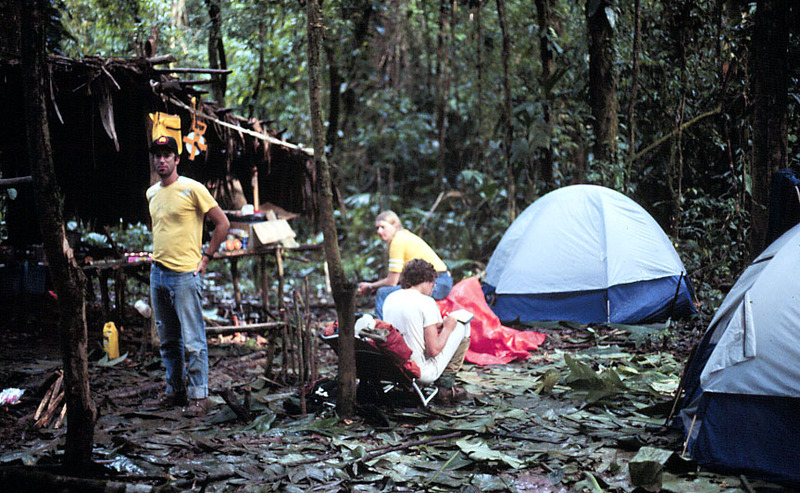 Sutawala base camp for the 1984 cavers; Larry Cohen on left, Trent Carr writing up the day's experiences in his journal, Debbie Hannah in background. Guatuza ready for the pot! 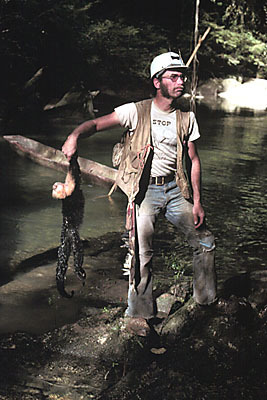 A native was hired to hunt for the caving party, given some shells for his .22, and this was the first bag. 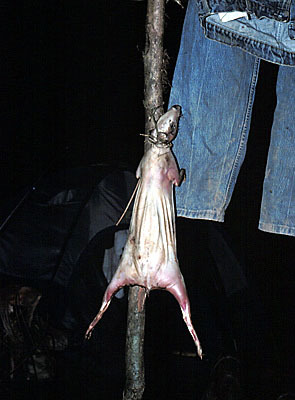 Guatuza (agouti in English) is a common forest rodent and pretty good eating with rice or pasta. Mono cara blanca (white-faced monkey) was also brought in by our hunter, somewhat to the chagrin of the cavers, as this species is not so common as the mono araña (spider monkey). Of the cavers, only Carr and Finch partook; the rest decided this was a bit too close to cannibalism, so the native hunter received most of the carcass to take home. 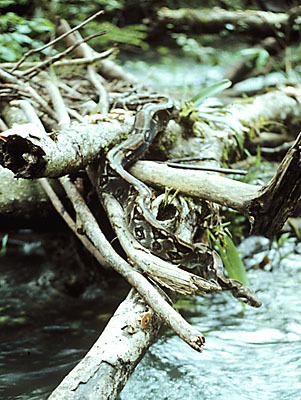 A good-sized boa encountered on a mass of flood debris lodged in the Sutawala River upstream from the first travertine dam. This snake, probably about 10 inches thick in the body and at least 10 feet long, was exceptionally beautiful with colors strong and shiny (unfortunately this does not show on the duplicate slide from which this scan was made). Perhaps it had just shed its skin recently? It was sluggish and did not move until touched gently on the tip of its snout with the point of a machete, at which time it backed up, moving its body backwards through the exact curves in which it lain undisturbed on the logs, as if it were a train backing along the tracks! Amazing! The native guide wanted to kill the snake; when asked why, the answer was not that he thought it poisonous (Honduran campesinos tend to think most all snakes are poisonous), but that he wanted to eat it. Undoubtedly, this was a lot of pounds of meat, but permission to kill the snake was denied, so the magnificent creature got away-- this time. As for poisonous snakes, this region is home to the barbamarilla, a type of fer de lance that is quite venomous, can be fairly large (like a diamondback rattler) and said to be aggressive when annoyed. On the 1984 caving trip a black and red banded snake was found in camp one night; pretty, but we couldn't determine whether it was dangerous or not before it got away into the thick foliage. Using the big pipante as a bridge across the Sutawala from camp to the Sutawala trail. Squishy Sutawala trail with a Nicaraguan refugee woman, barefoot and ever with a baby on her back, slogging towards Nicaragua. In the rainy season this trail is a quagmire of boot-sucking mud; the more it is traveled, the worse it gets. In the dry season, and perhaps without refugee traffic, it should not be so bad. Crossing a stream on a log, but why bother (other than to show off), since you're going to get your feet soaked anyway if the trail is muddy. Nacimiento Tirisne a spring near the base of the Tirisne cliffs. Danta (tapir) tracks were seen in the mud here. This spring is one of two resurgences along the south wall of the Sutawala Valley visited by the 1984 cavers. No enterable cave at either. View out from Cueva Jabalí, or Javelina Cave, near the base of the Tirisne cliffs. Here the 1984 cavers found several hundred feet of low cave, and the bones of one or more peccary, which obviously had used the cave as a shelter...wouldn't want to catch a live one at home. Climbing up the south wall of the Sutawala Valley to reach the high karst above the valley. Note almost directly above Finch the pink shirt of one of the natives hired to guide and cut trails. Yes, it's steep! Getting ready to load the pipante for the return trip. 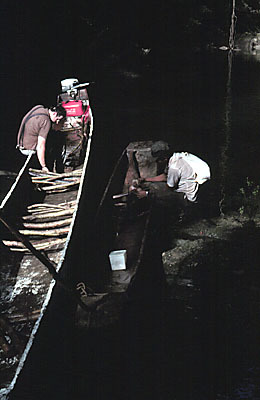 Note the freshly cut limbs wedged into the bottom of the boat; these are essential to keep gear up out of the water that is invariably shipped. 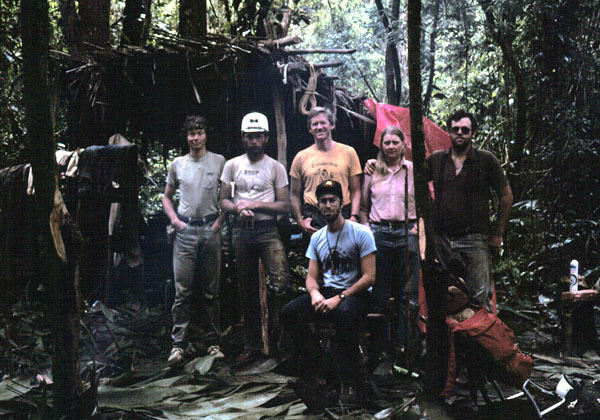 The 1984 cavers, left to right, Trent Carr, Ric Finch, Ed Yarbrough, Larry Cohen seated, Debbie and Elwin Hannah. We didn't do much caving in the MdeC, but we had a great adventure. Our lack of success in finding caves we attributed to the short time allotted for our stay. Of course, the difficulties of the awesome terrain contributed, too. The caves have to be there-- who will find them? "Something hidden. Go and find it. Go and look behind the ranges.